The basic idea behind (almost) all territorial marketing activities is the fact that the places are in competition with each other. In need for new investments, new tourists or just new money in general, they invent stuff and hire agencies like ours to promote their image. Usually such promotion is made in a classic manner, which means an indirect competition where everyone is pretending to be the best and the idea is to promote your city or region or whatever with something the others don't have. But sometimes - and it's where the real fun begins - guys start attacking. I mean, not just say "invest into our land", but "DO NOT invest in them and invest here INSTEAD". It's risky, because you can get a bunch of unexpected effects, but it's unusual and thus attractive. In most cases, it's a question of a Realpolitik combined with classic marketing goals. This was, for example, the case of a German land of Saxonia, whose government launched an arrogant offensive against the newly elected Green leaders of Bade-Wurtemberg, the richest land of the country with a GDP of €360 bln (while Grece's one is of €230 bln, so you get the idea of the scale). You've heard about the businesses in Bade-Wurtemberg even if you've never heard about the place itself: Daimler, Bosch, Porsche, SAP… All those guys have their headquarters in this magnificent place. Why would they want to leave it? The context is quite curious. Bade-Wurtemberg was always a dynamic region with an effective governance, an object of envy for all its neighbors. And then, the politics strike: the absolutely new government composed of the Green political party. The Greens, which is for local businesspeople Green in all senses. Rookies and inexperienced managers, they say. Thus, Martin Herrenknecht of a local big tunnel construction company, says: "The Greens have first of all to prove that they really can manage the technology in our region". Or a Swiss businessman Rudolf Louis who says (in a "Capital" journal): "The Greens are not a party that favors the automobile industry, I guess they don't even know the number of employees there". A political issue, one could say. So why not use it for promoting a neighbor region? The land of Saxonia goes to war, spending (according to the Saxe government speaker Sandra Vice Jaeschke) €75 000 on buying ad placeholders in five medias of the "greened" land. 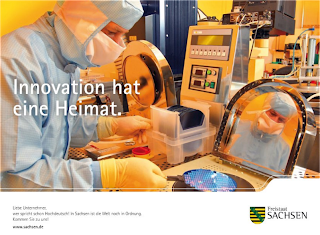 The text says: "Innovation has a home"
The message is sooo clear: "Dear entrepreneur who speak Hochdeutsch, in Saxonia, the world is still correct. Come to us". 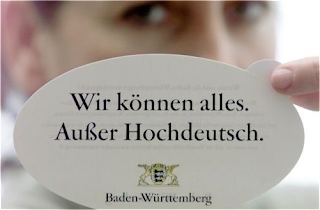 A fine reference to a cool ad campaign of Bade-Wurtemberg with their slogan "We can do everything. Except Hochdeutsh", the latter standing for "upper German", one of the main groups of dialects of the language. Text says: "We can do everything, except Hochdeutsch"
Difficult to say if this publicity will really make people move their companies, especially if we talk about such giants as Porsche. The Greens are skeptical: Boris Palmer, Green mayor of Tübingen, thinks that the campaign is a useless move that will "certainly not succeed", adding that he is against any "competition between lands". Well, I am for it! Same story for the people responsible for economical politics (Green) in the Stuttgart's Landtag (parliament) Edith Sitzmann: "This advertising campaign is not going to work, we will work together in the land for the companies to advance". But she adds: "…and Bade-Wurtemberg will anyway stay the best place to do business". So, a bit scared, Frau Sitzmann? en Sicile, allez Pavel au travail ! Je m'occupe del'édition !